Oklahoma is a state in the middle of the US. It's nickname is the Sooner State. Sooner was the name of the people who came to the land before it was part of the US. It's motto is Labor omnia vincit which means Hard work conquers all things. 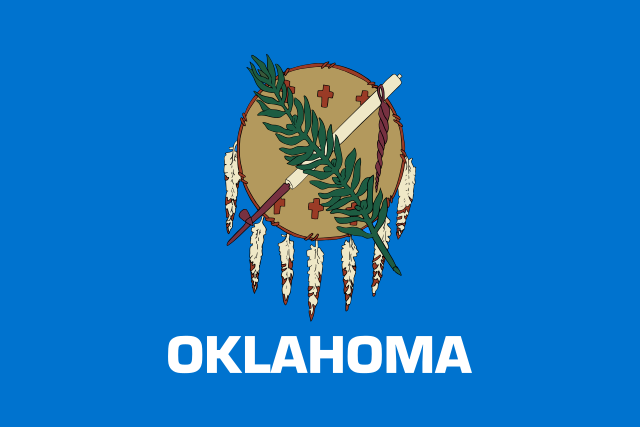 The flag of Oklahoma is a buffalo skin shield with eagle feathers on a blue background. 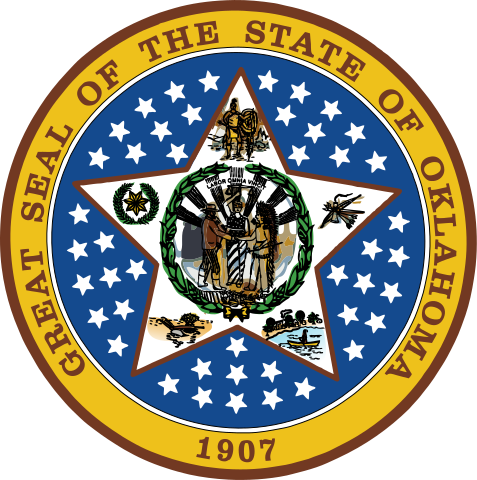 The seal of Oklahoma is a star in a circle. The pictures in the star are for the five Native American tribes in Oklahoma, Chickasaw, Cherokee, Choctaw, Creek and Seminole. The stars are for the 45 other states when Oklahoma became a state. Oklahoma is in an area called Tornado Alley, because they have more tornadoes than many other places. One of the first highways to go all the way across the US was called US 66. That highway started in Oklahoma, the first road going from Tulsa Oklahoma to Texas.